Seating is available for groups of 4 ONLY. You must be part of a group of 4 people to purchase. New Year’s Eve is undoubtedly the biggest night of the year, and Bourbon St. in New York City is celebrating Mardi Gras style. This one-of-a-kind, dual-level establishment captures the spirit New Orleans right here in the heart of New York City. 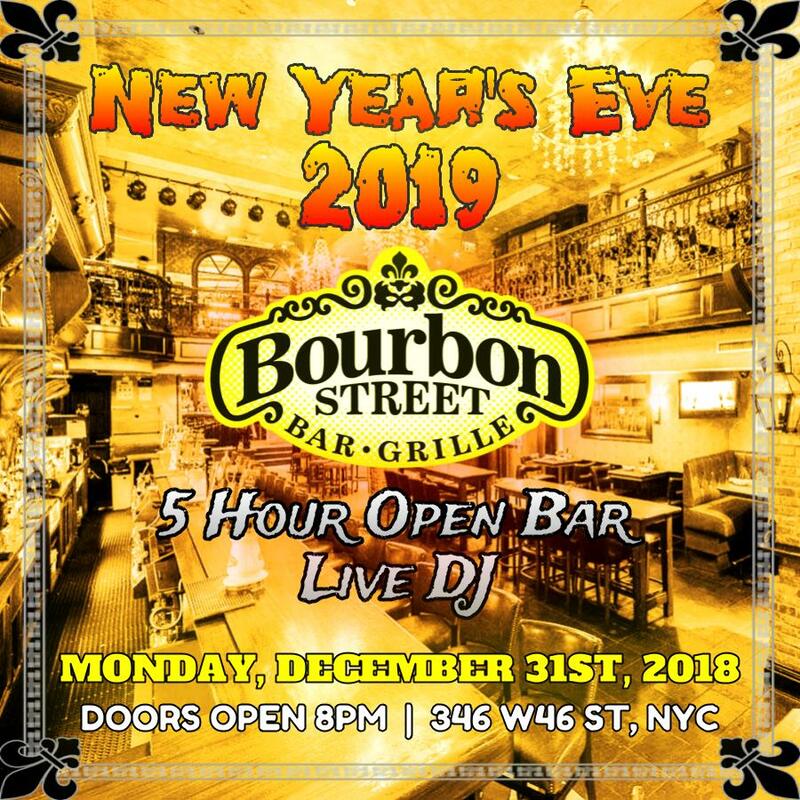 Located on Restaurant Row in the heart of the Theater District, Bourbon St. will give New Year’s Eve party-goers in NYC an experience like no other. Enjoy a five hour premium open bar and all the best music, including top 40, hip-hop, classic rock and more, that will be performed by a live DJ. If you’re in the Soco Lounge, you’ll enjoy bottle service and special VIP treatment. At midnight, guests will be able to witness all the live action of the NYE ball drop live from Times Square, and toast to the New Year with complimentary champagne. Bourbon St is the perfect place for couples looking for a taste of the Bayou in the Big Apple. Bourbon St. is the Mardi Gras-themed venue that NYC party goers can enjoy on every level this New Year’s Eve. From its inviting yellow exterior, all the way up to the patio, Bourbon St. exudes a Southern-Belle charm. The ground level of Bourbon St. is dedicated to a bar and lounge scene, with high-topped bar-level tables mixed in with intimate boots, both perfect for sit down conversations over cocktails. In the back room, more cozy lounge space is found, furnished with comfortable couches and wooden tables. On the second floor, you’ll find an amazing beer patio and lounge room with Louisiana-style flair. Mardi Gras beads hang from chandeliers, and tobacco colored seating anchors the black and white checkerboard floors and a Fleur de Lis motif , extending all around the room on hand-painted walls. Alligator heads double as lampshades and brick walls are covered in braziers. After all, at Bourbon St. on NYE, anything goes. This New Year’s Eve, come to Bourbon St. where the Big Easy meets the Big Apple for a NYE in NYC night that feels like the biggest carnival in the world.